A clean property is essential for any incoming visitors, whether it is for the owners or guests. No owners want to arrive to their property – especially late at night, and start making up beds and dusting away spider webs. By using a professional cleaning service, you can relax in the knowledge that you will arrive to a clean villa or apartment, freshly made up beds, and all services turned on and ready for use. Normally carried out twice a year, at the beginning and end of the summer season, although if owners request it, the property can be done at any time. Far more thorough than a basic changeover clean, this service will involve a comprehensive clean of the whole property, including checking electrical goods, lights and toilet flush. Lights, fans, windows and curtains will be cleaned, kitchen cupboards and oven thoroughly cleaned, and the outside of the property, grilles, shutters cleaned and terraces, patios etc. will be swept and hosed down. Includes beds being made up and towels laid out ready for visitors. A Clean property is your key to success in the letting market!! 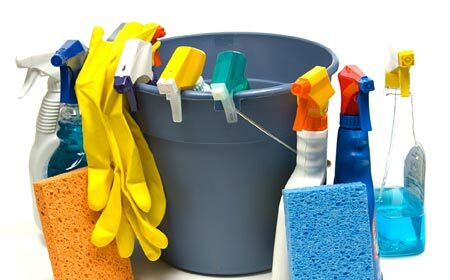 We will visit your property after each letting, giving it a full clean, kitchen, bathroom, appliances, polishing, sweep & mop floors, replace toilet rolls and towels, change bedding. Lightbulbs will be checked and replaced if necessary. Electrics can be left on or turned off as required. Cleaning of outside areas for villas with terraces being swept and gardens cleared of rubbish. Includes a high standard of clean & all cleaning materials. Laundry will be washed, ironed and stored ready for the next changeover. Owners should provide 2+, sets of bedding and towels to allow for any ‘accidents’ with your guests and same day changeovers. Maid Service during lets can be arranged at extra cost. Prices vary depending on whether a mid-stay clean includes a full clean as in a changeover with changing bed linen and towels. Change and laundering of bedding/towels only is priced at £20 per bedroom.